UPDATE: Carphone Warehouse to close all UK Best Buy stores | What Hi-Fi? Best Buy has now published an FAQ for customers regarding reports of its plans to close its UK stores. It says: "After conducting a thorough strategic review, we have announced that we are considering whether to continue operating Best Buy’s stores and website or whether we will close in the future but at this stage a decision has not yet been made." In response to the question "When will you close? ", its says: "We are not certain if and when we will close because we need to first consult with our employees. Our best current estimate is that we will stop trading in our stores and online by the end of the year." Regarding existing customers, it says those holding gift cards "can still redeem your gift card in any store. However, if a decision to stop trading is made, you will need to do this before we close our stores", and that those with products covered by service plans and instant replacement plans will not be affected: "Your service plan is not affected and will continue to be insured by Aviva. If you have any queries in relation to your service plan, please contact us online at bestbuy.co.uk/contact us or call us on 0800 380 0000." Carphone Warehouse is to close its 11 UK Best Buy 'big box' electrical stores with the potential loss of 1000 jobs. The move had been widely anticipated as losses continued to mount at the 50:50 joint venture between the American retail giant and Carphone Warehouse. The company has launched a consultation period with staff about closing the 11 stores as it shifts its focus to selling more portable electronics, such as mobile phones and tablets, through its smaller Carphone Warehouse outlets. Carphone says it hopes to find the "large majority" of the existing 1100 staff roles elsewhere within the group. 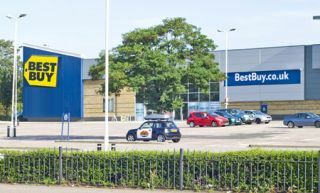 "The eleven Best Buy UK 'Big Box' stores have performed exceptionally at the level of customer satisfaction, but they do not have the national reach to achieve scale and brand economies," concedes Roger Taylor, chief executive of Carphone Warehouse. "Due to the lack of visibility of an acceptable rate of return on historical and future potential investment we have decided against rolling out more 'Big Box' stores and we will be closing our existing stores, subject to consultation with our employees," Taylor added. Best Buy made a loss of £62 million in its first year in the UK and analysts expect it to report a loss of £35 million in the first half of 2011 alone. The company anticipates further operating losses of around £25-£30m up to the point of closure, with the cost of closing the stores amounting to a further £65-£75m after tax. Carphone Warehouse is selling its share of Best Buy Mobile's US and Canadian business to the US firm for £838m. Best Buy Europe was formed in 2008 when Best Buy paid £1.1bn to buy a 50% stake in Carphone Warehouse's retail division. The new venture opened its first store in Thurrock, Essex in 2010 and this was followed with outlets in Merry Hill (West Midlands), Aintree (Liverpool), Croydon, Derby, Bristol, Nottingham, Enfield, Southampton, Rotherham and Hayes. This time last year Best Buy launched its UK online store – which is also threatened with closure. Seen as a rival to the likes of Currys and Comet, Best Buy hoped to shake up the consumer electronics market with cheaper prices and better service. The original plan envisaged 200 stores across Europe, but this was soon scaled back. The electronics retail sector has been hard hit by the recession, and the company says the combination of the recession, online competition and the growth of new product sectors such as tablets and smartphones led to a downturn in sales of large electrical items. Best Buy Europe chief executive Andrew Harrison says: "The technology world has changed substantially since 2008 and we are confident we will best serve our customers by investing in a single brand and format rather than two."